In human cells, vitamins often serve as the precursors of "cofactors" – non-proteins which are an essential part of enzymes. Among them are the flavins, which the organism derives from vitamin B2. 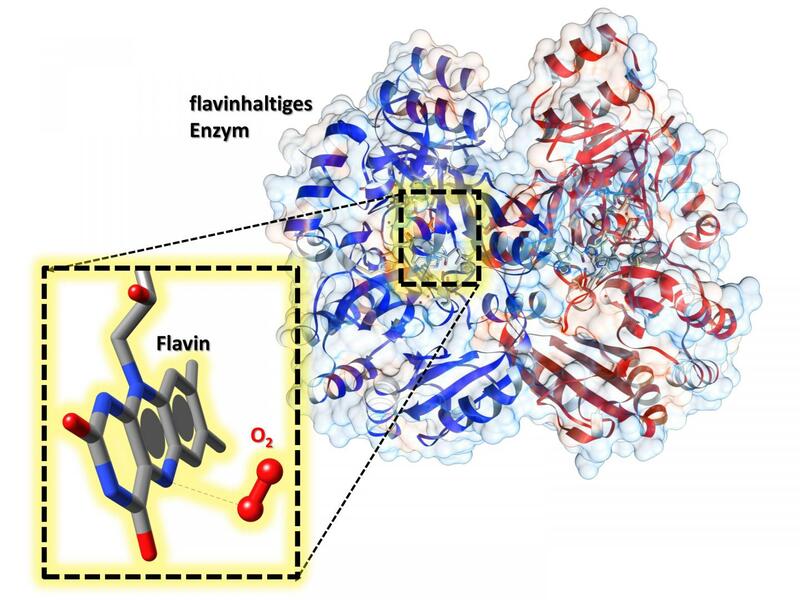 A team headed by Dr. Robin Teufel and Dr. Raspudin Saleem-Batcha of the University of Freiburg at the Center for Biological Systems Analysis has now shown in detail how oxygen interacts with the flavin in an enzyme – revealing for the first time precisely how it works. The researchers have published their results in the latest Proceedings of the National Academy USA (PNAS). Flavins play a key role in metabolic processes, in the immune system and in neural development in humans – and are equally important to bacteria, fungi and plants. Flavoenzymes often require oxygen to function. But until now many of the details of their interaction were not known. The researchers used x-ray diffraction analysis to show for the first time that oxygen is bound to a special pocket inside the enzyme. The nature of this compound makes it possible to activate the cofactor – making it essential for the enzyme to work. This knowledge may help, for example, to rationally modify flavoenzymes in the future – in basic research or for biotechnological applications.